Now that it’s sweater weather, what better time is there for a nice stroll through some greenery (orange-ry)? Good for your heart and the best way to view the seasonal change, there are some top notch walking and running trails in the Valley to keep you moving (and motivate you to get out there). If you’re itching to make your 10,000 steps for the day, training for that 10K, or just looking for a way to get out of the house, let these trails be your guide. For those in Emmaus or closer to the Macungie area, it can be hard to run on streets without safe sidewalks and in the midst of busy roads. However, you’re in for some great hills and terrific scenery if you know where to go. South Mountain is great, even for experienced trail runners and newbies looking for a challenge (and has great biking and hiking trails, too). The loop is a well-marked about 8.5 mile moderate terrain wooded setting, with additional loops to choose from for an easier or more difficult run. Are you in the Christmas City or downtown A-town and need inspiration for parks near you but unsure of their locations? Check out Bethlehem Parks / Allentown Parks Finder for a map view of parks. Bethlehem’s Monocacy Park has wonderful walking and mild hiking opportunities, not to mention the chance to fish or simply sit and enjoy nature, while sitting only 10 minutes from downtown Main Street. In Allentown, the Lil’-Le-Hi Trout Nursery on Fish Hatchery Road provides some quiet-ish pavement running on sidewalks and trails with wooded views and river scenery––and you can stop and feed the fish if you’d like! Lehigh Parkway’s 6-mile loop is great for social runners (there are always people on this one, but check the event calendar; you never know what’s going on in the area!) and has a few hills to add a bit of a terrain change. Some of this area is paved as well, so you can utilize both trail and pavement running options. The D&L Rail Trail (which is about 165 miles total) section running from Allentown to Easton is a great path for runners looking for a long-distance trek or shorter, well-kept trails. Broken into sections (that all average about 3.5 miles each), the flat concrete path is shaded and turns to gravel/dirt when closer to Palmer. Easy for an out-and-back trip, less crowded, and perfect if you’d like to avoid the hills of other trails in the Valley. Another section of this trail, running from the Northampton area to Lehighton, is a quiet, flat offshoot made primarily of cinders, with other paved options in the Walnutport area and a series of rocky trails closer to Lehighton. Also in Northampton is the 5.1 mile (10 mile out-and-back) Nor-Bath Trail perfect for solo (or tandem) runs as it’s not heavily traversed. In the Coplay/Whitehall area, the Ironton Rail Trail provides a 5.3 mile loop that is mostly paved, well-traveled, and easy to traverse. This would be a great spot to join a friend for a run or easy walk. Great for a small run (and perhaps for intervals, sprints, or run/walk training) in North Whitehall is Kolapechka Park trail, wrapped around a kids’ park, clocked in just under a mile. This one could be perfect if you’re transitioning from city/pavement running to trail and you’d like to test your strength on a cinder trail. In Schnecksville, the Trexler Nature Preserve (this one has awesome hiking options too - see below for more on that!) has great running trails, suitable for all levels and ages. Mostly packed dirt trails, there is an outer 8.5-mile path and a mixture of shorter paved/dirt trails to choose from. Since it surrounds the Lehigh Valley Zoo, it’s a great spot for meetups, team/family runs, or just a friendly, scenic stroll. 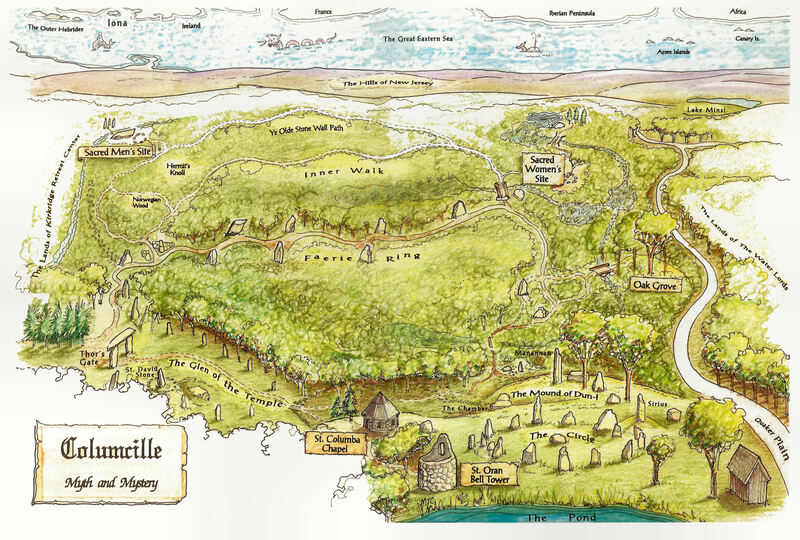 Also within the northern reaches of the Valley in Bangor is Columcille Megalith Park, which is perfect for outdoor meditation, simple walking, perhaps a bit of trail running, and just enjoying nature (Side note: Their illustrated park map is enough to awaken the fantasy nerd in all of us). Self-titled as an “outdoor sanctuary,” this park’s collection of large stone structures provides spiritual and inspiring scenery. Are you a social runner or just looking to meet others who share in your love of hitting the pavement or might give you the boost you need to start running on a more regular basis? Maybe you love running on your own but would like an ear to the ground about local races. Check out these running clubs and running opportunities in the Lehigh Valley and lace up your sneakers and go! One of the best parts of living in (or visiting) the Lehigh Valley is the great mix of the outdoors and city life. You can head out for a morning hike or afternoon trek and then find a multitude of happy hour options when you return. Check out some of our picks for hiking trails/parks (for all levels) to try today and then get together with friends, family, or the friendly people in the meetup options around the Valley to fuel what will most likely become a need for nature once you see the local beauty that’s only minutes away. Mentioned above for its stellar running trails, Trexler Nature Preserve (Schnecksville) has a ton of hiking options of varying degrees of difficulty as well. The extensive Trail map provides information about the just over a dozen trails that the Preserve offers. There are spaces for mountain biking, picnics, bird viewing, fishing and kayaking in the Jordan Creek, and camping as well. While the Trexler Border trail can be a tough one, the views make the trek more than worthwhile. Hawk Mountain, which is about a 30-minute drive immediately to the west of the Lehigh Valley area, has five trails that are mostly short but have some elevation changes. This site is a Sanctuary for local raptor and hawk populations and serves as a model for conservation of these birds of prey worldwide. There is a minor fee to hike here, but be rest assured that the small price is helping to improve conservation and protection efforts. For the experienced hikers (or casual hikers looking for a challenge), the section of the Appalachian Trail from Bake Oven Knob to the Lehigh Gap, stretching about 9.5 miles, is one of the highest rated in the area––both for scenery and bragging rights. The trail’s great for a day trip or overnight and takes you over the Lehigh Tunnel. Just beware that this one isn’t for beginners and while it’s moderate at times, it’s exposed and you should be prepared for the elements. If you want all the views but a bit less of the length and the work, hike the teeny 0.4 mile trail from Bake Oven Road to the top of Bake Oven Knob. If you’re closer to Nazareth, then you can check out the 18.5 miles of trails in Jacobsburg State Park (also known as Jacobsburg Environmental Education Center). The attractive area in Henrys Woods (part of the Center) has wooded scenery, streams, Bushkill Creek, and community events and education opportunities for visitors of all ages. Just a note of caution: Part of the Center’s land is used for hunting, so if you’re planning to wander the area during hunting season, plan to grab yourself some blaze orange or super bright apparel to bring along. For group meetings and chances to explore hiking trails you may not want to try on your own, check out the Allentown Hiking Club or the Greater Lehigh Valley Outdoor Adventures Meetup (and check out their site for even more meetup options in the area). TrailLink is also a great resource for more running/walking/hiking trail options in your area! Do you have a favorite walking, running, or hiking trail in the Lehigh Valley that you’d like to share? Be sure to let us know in the comments!